The local government areas (LGA) of New South Wales in Australia describes the institutions and processes by which areas, cities, towns, municipalities, regions, shires, and districts can manage their own affairs to the extent permitted by the Local Government Act 1993 (NSW). Local government authorities provide a wide range of services. The most important of these are the general services of administration, health, community amenities, recreation and culture, roads and debt servicing throughout the area controlled by the council. Councils also provide a range of trading activities, mainly in country areas of NSW. These trading activities include water supply, sewerage services, gas services and abattoir facilities. Administered by the Government of New South Wales and subject to periodic restructuring involving voluntary and involuntary amalgamation of areas, local government areas are considered a city when an area has received city status by proclamation of the Governor. Some areas retain designations they held under prior legislation, even though these titles no longer indicate a legal status. These include municipalities (that are predominantly inner-city suburban areas and smaller rural towns) and shires (that are predominantly rural or outer suburban areas). Many councils now choose not to use any area title, and simply refer to themselves as councils, e.g. Northern Beaches Council, Burwood Council. The smallest local government by area in the state is the Municipality of Hunter's Hill; the largest by area is Central Darling Shire Council. The formation of local government in New South Wales predates the formation of responsible government in the state. The Sydney Corporation was formed in 1842, an elected body to manage primary services such as street lighting and drainage. The Municipalities Act, 1858 introduced a system of local government. Municipalities were compulsorily incorporated by legislation in 1876, the third Municipalities Act, 1897 consolidated municipal law, and in 1905 the Local Government (Shires) Act 1905 was enacted to establish shires. The Local Government Act, 1906 reformed the municipal system, replaced by the Local Government Act, 1919, which lasted until the most recent 1993 Act. a better distinction between service provision and regulatory activity was drawn. Maximum flexibility was given in respect to service provision, with some constraints, and accountability was increased. In regard to regulatory functions, proper attention had to be given to due process and procedural correctness. The NSW Government has undertaken periodic reviews of local government since the early 1900s. Reforms included providing enfranchisement for women and for residents who did not own property in the LGA, standardising land valuation systems, and the introduction of ordinances. The Greater Newcastle Act 1937 amalgamated 10 municipalities with the City of Newcastle to form Greater Newcastle. In the post-war period, the Labor Party government of James McGirr, led by Joseph Cahill as Minister for Local Government, decided, following the recommendations of the 1945–46 Clancy Royal Commission on Local Government Boundaries, that Local Government reform would assist the process of improving state infrastructure and community facilities. This vision for a local government reform agenda, including large-scale amalgamations, was largely implemented in the Sydney basin through the Local Government (Areas) Act 1948. The Barnett Committee Review of Local Government Areas, conducted during 1973-74, sought to create stronger economic LGAs through a substantial reduction in council numbers. The Barnett Report recommended the forced merging of the then 223 existing local government entities into 97 districts; a proposal that was initially rejected by the Askin–led coalition government. However by 1980 and after several references to the NSW Local Government Boundaries Commission, the Wran-led Labor government amalgamated 38 councils into 17 entities. The Bains of 1978 influenced the adoption of corporate management in councils whereby council affairs were dealt with as a whole and with co-ordinated forward planning, comprehensive distribution of resources and proper performance monitoring. Bains' review had major influence on the engagement of more powerful general managers, councillors becoming policy makers, and staff free from administrative councillor interference. Completed by the NSW Local Government Boundaries Commission, this review focused on the efficiencies in the mergers of rural and regional councils and the anticipated economies of scale in service provision. The Local Government Areas Amalgamation Act 1980 saw the amalgamation of many municipalities with the shires that neigboured - and in some instances, surrounded - them. The Carr-led Labor government initiated the Local Government Reform Task Force of 1995-97, the principal outcome of which was to promote resource sharing through the various regional organisations of councils. Triggered by a paper issued by the NSW Local Government and Shires Association, twenty-one councils reviewed their own position and explored three options including the status quo, models for resource sharing and a merger. However, only four councils entered into voluntary mergers in order to avoid potential forced amalgamations. 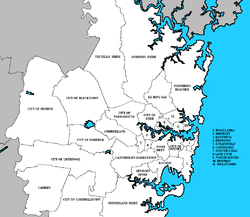 The Sproats Inquiry into the structure of local government in eight council areas of the Inner City and Eastern Suburbs of Sydney was commissioned by the state government in October 2000. Despite recommendations for mergers, with the Carr government maintaining a no-forced amalgamation policy, no mergers transpired until late 2008 when Sproats was invited to review his earlier paper, including revisiting the controversial proposal to amalgamate the City of Sydney Council with the South Sydney City Council. The Carr government abandoned its policy of no forced mergers after the 2003 state election. Within a year, regional “super” councils were legislated for Inner Sydney, surrounding Canberra, Goulburn and Tamworth; four general purpose and two county councils were merged in Clarence Valley, as well as a number of other smaller-scale rural council amalgamations. In October 2013, the NSW Government released the findings of an independent review of local government in New South Wales. The review findings, entitled Revitalising Local Government, examined historical and projected demographic data, financial sustainability, and other measures and projected the long-term viability all local government bodies in the state. Included in the report were 65 recommendations to the government. 56 per cent of councils in regional NSW were 'not fit', due to not proposing a merger despite clear benefits, ongoing deficits or both. The IPART proposed a series of council mergers and amalgamation in both metropolitan and regional areas which proposed a reduction in the number of councils from 152 to 112. The NSW Government invited local government authorities to respond by 20 November 2015. Public response to the proposed amalgamations was mixed. Following consideration of the submissions, the Minister for Local Government referred merger proposals to the Chief Executive of the Office of Local Government (OLG) for examination and report under the Local Government Act. The OLG Chief Executive delegated the examination and reporting functions to Delegates who conducted public inquiries and invited further written submissions by 28 February 2016. On 12 May 2016, following a further review by the Minister for Local Government and the independent Local Government Boundaries Commission, Premier Mike Baird announced the creation of 19 new councils, through amalgamations and mergers, with immediate effect. The Minister indicated in principle support to create a further nine new councils, subject to the decision of the courts. On the same day, the Governor of New South Wales acted on the advice of the Minister, and proclaimed the 19 new local government areas. On 9 May 2016, Strathfield Council challenged the proposed merger between Strathfield, Burwood and Canada Bay councils and commenced proceedings in the New South Wales Land and Environment Court. After the Court heard that there were legal flaws in the report from the State Government-appointed delegate who examined the proposal for merging the councils, on 31 May, the NSW Government withdrew from the case and the merger proposal stalled. Mosman, Hunters Hill, North Sydney, Ku-ring-gai, Woollahra, Oberon and Walcha councils also challenged the Government's amalgamations. The proclamation of the new Bayside Council occurred on 9 September 2016, following the conclusion of legal action by Botany Bay City Council in the Court of Appeal. In December, the NSW Court of Appeal unanimously dismissed Woollahra Council's appeal, finding no merit in its arguments that the proposed merger with its neighbouring councils was invalid. In July 2017, the Berejiklian government decided to abandon the forced merger of the Sydney local government areas, following an earlier move to abandon proposed forced mergers in rural and regional NSW. 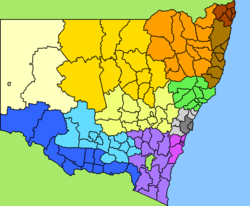 As of 9 September 2016[update] there were 128 local government areas in New South Wales, listed below in alphabetical order by region. There is also the Unincorporated Far West Region which is not part of any local government area, in the sparsely inhabited Far West, and Lord Howe Island, which is also unincorporated but self-governed by the Lord Howe Island Board. ^ "Special Article - The History of Government in New South Wales". New South Wales Year Book, 1998. Australian Bureau of Statistics, Australian Government. 7 March 2008. Retrieved 1 January 2017. ^ Kelly, A. H. (4–8 July 2011). The Development of Local Government in Australia, Focusing on NSW: From Road Builder to Planning Agency to Servant of the State Government and Developmentalism (Paper). World Planning Schools Congress 2011. Perth: University of Wollongong. Retrieved 1 January 2017. ^ a b c d e f g h i Tiley, Ian; Dollery, Brian (April 2010). "Local Government Amalgamation in New South Wales". Centre for Local Government. University of New England. ^ a b "Local Government Directory". Office of Local Government. Government of New South Wales. Retrieved 25 May 2016. ^ "4895 Royal Commission on Local Government Boundaries". State Records Archives Investigator. State Archives and Records Authority of New South Wales. Retrieved 2 November 2017. ^ Sansom, Graham; Munro, Jude; Inglis, Glenn (25 October 2013). "Revitalising Local Government: Final Report" (PDF). Independent Local Government Review Panel. Government of New South Wales. Retrieved 11 January 2015. ^ "Reform – Fit for the Future". Local Government NSW. 2015. Retrieved 11 January 2015. ^ Baird, Mike (22 April 2015). "Terms of Reference for a review of local council Fit for the Future proposals by an Expert Advisory Panel" (PDF) (Press release). NSW Independent Pricing and Regulatory Tribunal. Retrieved 15 November 2015. ^ Baird, Mike; Toole, Paul (20 October 2015). "Fit for the future: $2 billion community windfall by merging unfit councils" (Press release). Government of New South Wales. Retrieved 15 November 2015. ^ "NSW councils to merge under State Government plan for forced amalgamations; 2016 elections delayed". ABC News. Retrieved 21 December 2015. ^ Kembrey, Melanie. "Council mergers: expert adviser Graham Sansom slams merger proposals". The Sydney Morning Herald. Retrieved 21 December 2015. ^ "Background". Council Boundary Review. Government of New South Wales. Retrieved 18 February 2016. ^ "Introduction". Stronger Councils. Government of New South Wales. 12 May 2016. Retrieved 12 May 2016. ^ "New councils for NSW". Family & Community Services (Press release). Government of New South Wales. 12 May 2016. Retrieved 12 May 2016. ^ "Local Government (Council Amalgamations) Proclamation 2016" (PDF). Stronger Councils. Government of New South Wales. Retrieved 12 May 2016. ^ Raper, Ashleigh (31 May 2016). "NSW council amalgamations: Strathfield, Burwood and Canada Bay merger stopped". ABC News. Australia. Retrieved 1 June 2016. ^ Davies, Anne (31 May 2016). "Council amalgamations: government push for mergers suffers setback". The Sydney Morning Herald. Retrieved 1 June 2016. ^ "Joint Organisation – Council Secure Portal". www.strongercouncils.nsw.gov.au. ^ Visentin, Lisa (22 December 2016). "Woollahra loses merger appeal, hints at High Court challenge". The Sydney Morning Herald. Retrieved 31 December 2016. ^ Australian Bureau of Statistics (27 June 2017). "Botany Bay (C)". 2016 Census QuickStats. Retrieved 5 July 2017. ^ Australian Bureau of Statistics (27 June 2017). "Rockdale (C)". 2016 Census QuickStats. Retrieved 5 July 2017. ^ "Bayside Council". Stronger Councils. Government of New South Wales. 9 September 2016. Retrieved 9 September 2016. ^ a b c d e f g h i j k l m n o p q r s t "Local Government (Shires) Act 1905 Proclamations". Government Gazette of the State of New South Wales (Sydney, NSW: 1901–2001). 7 March 1906. pp. 1593–1644. Retrieved 15 June 2018. ^ Australian Bureau of Statistics (27 June 2017). "Blacktown (C)". 2016 Census QuickStats. Retrieved 5 July 2017. ^ Australian Bureau of Statistics (27 June 2017). "Burwood (A)". 2016 Census QuickStats. Retrieved 5 July 2017. ^ "Government Gazette Proclamations and Legislation - New South Wales Government Gazette (Sydney, NSW: 1832–1900) - 27 Mar 1874". nla.gov.au. Retrieved 3 March 2017. ^ Australian Bureau of Statistics (27 June 2017). "Camden (A)". 2016 Census QuickStats. Retrieved 5 July 2017. ^ "Government Gazette Proclamations and Legislation - New South Wales Government Gazette (Sydney, NSW: 1832–1900) - 6 Feb 1889". nla.gov.au. Retrieved 3 March 2017. ^ Australian Bureau of Statistics (27 June 2017). "Campbelltown (C)". 2016 Census QuickStats. Retrieved 5 July 2017. ^ "Government Gazette Proclamations and Legislation - New South Wales Government Gazette (Sydney, NSW: 1832–1900) - 21 Jan 1882". nla.gov.au. Retrieved 3 March 2017. ^ Australian Bureau of Statistics (27 June 2017). "Canada Bay (A)". 2016 Census QuickStats. Retrieved 5 July 2017. ^ "Government Gazette Proclamations and Legislation - New South Wales Government Gazette (Sydney, NSW: 1832–1900) - 11 Aug 1883". nla.gov.au. Retrieved 3 March 2017. ^ Australian Bureau of Statistics (27 June 2017). "Canterbury-Bankstown (A)". 2016 Census QuickStats. Retrieved 5 July 2017. ^ Australian Bureau of Statistics (27 June 2017). "Cumberland (A)". 2016 Census QuickStats. Retrieved 5 July 2017. ^ Australian Bureau of Statistics (27 June 2017). "Fairfield (C)". 2016 Census QuickStats. Retrieved 5 July 2017. ^ Australian Bureau of Statistics (27 June 2017). "Georges River (A)". 2016 Census QuickStats. Retrieved 5 July 2017. ^ "Georges River Council". Stronger Councils. Government of New South Wales. 12 May 2016. Retrieved 15 May 2016. ^ Australian Bureau of Statistics (27 June 2017). "The Hills Shire (A)". 2016 Census QuickStats. Retrieved 5 July 2017. ^ Australian Bureau of Statistics (27 June 2017). "Hornsby (C)". 2016 Census QuickStats. Retrieved 5 July 2017. ^ Australian Bureau of Statistics (27 June 2017). "Hunters Hill (A)". 2016 Census QuickStats. Retrieved 5 July 2017. ^ "Municipality of Hunter's Hill - Proclamation - New South Wales Government Gazette (Sydney, NSW: 1832–1900) - 7 Jan 1861". Trove. Retrieved 1 October 2016. ^ Australian Bureau of Statistics (27 June 2017). "Inner West (A)". 2016 Census QuickStats. Retrieved 5 July 2017. ^ "Inner West Council". Stronger Councils. Government of New South Wales. 12 May 2016. Retrieved 15 May 2016. ^ Australian Bureau of Statistics (27 June 2017). "Ku-ring-gai (A)". 2016 Census QuickStats. Retrieved 5 July 2017. ^ Australian Bureau of Statistics (27 June 2017). "Lane Cove (A)". 2016 Census QuickStats. Retrieved 5 July 2017. ^ "Government Gazette Proclamations and Legislation - New South Wales Government Gazette (Sydney, NSW: 1832–1900) - 11 Feb 1895". nla.gov.au. Retrieved 3 March 2017. ^ Australian Bureau of Statistics (27 June 2017). "Liverpool (C)". 2016 Census QuickStats. Retrieved 5 July 2017. ^ Australian Bureau of Statistics (27 June 2017). "Mosman (A)". 2016 Census QuickStats. Retrieved 5 July 2017. ^ "Government Gazette Proclamations and Legislation - New South Wales Government Gazette (Sydney, NSW: 1832–1900) - 11 Apr 1893". Trove. Retrieved 1 October 2016. ^ Australian Bureau of Statistics (27 June 2017). "Northern Beaches (A)". 2016 Census QuickStats. Retrieved 5 July 2017. ^ Australian Bureau of Statistics (27 June 2017). "North Sydney (A)". 2016 Census QuickStats. Retrieved 5 July 2017. ^ "Government Gazette Proclamations and Legislation - New South Wales Government Gazette (Sydney, NSW: 1832–1900) - 31 Jul 1890". Trove. Retrieved 1 October 2016. ^ Australian Bureau of Statistics (27 June 2017). "Parramatta (C)". 2016 Census QuickStats. Retrieved 5 July 2017. ^ Australian Bureau of Statistics (27 June 2017). "Penrith (C)". 2016 Census QuickStats. Retrieved 5 July 2017. ^ "History of Local Government development in the Penrith and Surrounding Districts". Penrith City Council. 25 May 2009. Archived from the original on 22 June 2014. Retrieved 12 November 2009. ^ Australian Bureau of Statistics (27 June 2017). "Randwick (C)". 2016 Census QuickStats. Retrieved 5 July 2017. ^ "Municipality of Randwick - Proclamation - New South Wales Government Gazette (Sydney, NSW: 1832–1900) - 23 Feb 1859". nla.gov.au. Retrieved 3 March 2017. ^ Australian Bureau of Statistics (27 June 2017). "Ryde (C)". 2016 Census QuickStats. Retrieved 5 July 2017. ^ Australian Bureau of Statistics (27 June 2017). "Strathfield (A)". 2016 Census QuickStats. Retrieved 5 July 2017. ^ Australian Bureau of Statistics (27 June 2017). "Sutherland Shire (A)". 2016 Census QuickStats. Retrieved 5 July 2017. ^ Australian Bureau of Statistics (27 June 2017). "Sydney (C)". 2016 Census QuickStats. Retrieved 5 July 2017. ^ "History of Sydney City Council" (PDF). City of Sydney. Archived from the original (PDF) on 3 December 2012. Retrieved 9 February 2007. ^ Australian Bureau of Statistics (27 June 2017). "Waverley (A)". 2016 Census QuickStats. Retrieved 5 July 2017. ^ "Proclamation of the incorporation of the district of Waverley as a Municipality". NSW Government Gazette No. 115, 16 June 1859, folios 1343–1344. 16 June 1859. ^ Australian Bureau of Statistics (27 June 2017). "Willoughby (C)". 2016 Census QuickStats. Retrieved 5 July 2017. ^ "Local Government Act 1919 - Proclamation - Government Gazette of the State of New South Wales (Sydney, NSW: 1901–2001) - 17 Nov 1989". nla.gov.au. Retrieved 3 March 2017. ^ "Municipality of North Willoughby - Proclamation - New South Wales Government Gazette (Sydney, NSW: 1832–1900) - 25 Oct 1865". nla.gov.au. Retrieved 3 March 2017. ^ Australian Bureau of Statistics (27 June 2017). "Woollahra (A)". 2016 Census QuickStats. Retrieved 5 July 2017. ^ Jarvis & Kelly (1960). The History of Woollahra. Sydney: Halstead Press. ^ Australian Bureau of Statistics (27 June 2017). "Blue Mountains (C)". 2016 Census QuickStats. Retrieved 6 July 2017. ^ "Overview of the Council". Introduction to Blue Mountains City Council. Blue Mountains City Council. Retrieved 5 May 2016. ^ Australian Bureau of Statistics (27 June 2017). "Central Coast (C)". 2016 Census QuickStats. Retrieved 6 July 2017. ^ "Government Gazette Proclamations and Legislation - New South Wales Government Gazette (Sydney, NSW: 1832–1900) - 11 Nov 1886". Trove. Retrieved 1 October 2016. ^ Australian Bureau of Statistics (27 June 2017). "Hawkesbury (C)". 2016 Census QuickStats. Retrieved 6 July 2017. ^ "Hawkesbury City Council - Overview". Hawkesbury City Council. 2017. Retrieved 6 July 2017. ^ Australian Bureau of Statistics (27 June 2017). "Wollondilly (A)". 2016 Census QuickStats. Retrieved 6 July 2017. ^ "Proclamation - Government Gazette of the State of New South Wales (Sydney, NSW: 1901–2001) - 7 Mar 1906". Trove. Retrieved 1 October 2016. ^ Australian Bureau of Statistics (27 June 2017). "Bellingen (A)". 2016 Census QuickStats. Retrieved 7 July 2017. ^ a b "Local Government Act, 1919—Proclamation - Government Gazette of the State of New South Wales (Sydney, NSW: 1901–2001) - 30 Nov 1956". nla.gov.au. Retrieved 3 March 2017. ^ Australian Bureau of Statistics (27 June 2017). "Clarence Valley (A)". 2016 Census QuickStats. Retrieved 7 July 2017. ^ Australian Bureau of Statistics (27 June 2017). "Coffs Harbour (C)". 2016 Census QuickStats. Retrieved 7 July 2017. ^ "Local Government Act 1919—Proclamation - Government Gazette of the State of New South Wales (Sydney, NSW: 1901–2001) - 1 May 1987". nla.gov.au. Retrieved 3 March 2017. ^ Australian Bureau of Statistics (27 June 2017). "Kempsey (A)". 2016 Census QuickStats. Retrieved 7 July 2017. ^ "Government Gazette Proclamations and Legislation - New South Wales Government Gazette (Sydney, NSW: 1832–1900) - 11 Jun 1886". nla.gov.au. Retrieved 3 March 2017. ^ Australian Bureau of Statistics (27 June 2017). "Nambucca (A)". 2016 Census QuickStats. Retrieved 7 July 2017. ^ "Proclamation - Government Gazette of the State of New South Wales (Sydney, NSW: 1901–2001) - 15 Dec 1915". nla.gov.au. Retrieved 3 March 2017. ^ Australian Bureau of Statistics (27 June 2017). "Port Macquarie-Hastings (A)". 2016 Census QuickStats. Retrieved 7 July 2017. ^ "History of the Council". Port Macquarie-Hastings Council. 28 February 2008. Retrieved 26 March 2008. ^ Australian Bureau of Statistics (27 June 2017). "Lord Howe Island (State Suburb)". 2016 Census QuickStats. Retrieved 7 July 2017. ^ Australian Bureau of Statistics (27 June 2017). "Albury (C)". 2016 Census QuickStats. Retrieved 7 July 2017. ^ "Albury and District Historical Society". Research and references. Albury City Council. Archived from the original on 23 July 2008. Retrieved 8 July 2008. ^ Australian Bureau of Statistics (27 June 2017). "Balranald (A)". 2016 Census QuickStats. Retrieved 7 July 2017. ^ Australian Bureau of Statistics (27 June 2017). "Berrigan (A)". 2016 Census QuickStats. Retrieved 7 July 2017. ^ Australian Bureau of Statistics (27 June 2017). "Edward River (A)". 2016 Census QuickStats. Retrieved 7 July 2017. ^ "Edward River Council". Stronger Councils. Government of New South Wales. 12 May 2016. Retrieved 18 May 2016. ^ Australian Bureau of Statistics (27 June 2017). "Federation (A)". 2016 Census QuickStats. Retrieved 7 July 2017. ^ "Federation Council". Stronger Councils. Government of New South Wales. 12 May 2016. Retrieved 13 May 2016. ^ Australian Bureau of Statistics (27 June 2017). "Greater Hume Shire (A)". 2016 Census QuickStats. Retrieved 7 July 2017. ^ Australian Bureau of Statistics (27 June 2017). "Murray River (A)". 2016 Census QuickStats. Retrieved 7 July 2017. ^ "Murray River Council". Stronger Councils. Government of New South Wales. 12 May 2016. Retrieved 13 May 2016. ^ Australian Bureau of Statistics (27 June 2017). "Wenthworth (A)". 2016 Census QuickStats. Retrieved 7 July 2017. ^ "Wentworth History". Wentworth Shire Council. Archived from the original on 11 July 2009. Retrieved 23 January 2010. ^ Australian Bureau of Statistics (27 June 2017). "Bland (A)". 2016 Census QuickStats. Retrieved 7 July 2017. ^ "Local Government Act, 1919—Proclamation". Government Gazette of the State of New South Wales (Sydney, NSW: 1901–2001). 5 November 1943. p. 1932. Retrieved 20 June 2018. ^ Australian Bureau of Statistics (27 June 2017). "Carrathool (A)". 2016 Census QuickStats. Retrieved 7 July 2017. ^ Australian Bureau of Statistics (27 June 2017). "Coolamon (A)". 2016 Census QuickStats. Retrieved 7 July 2017. ^ Australian Bureau of Statistics (27 June 2017). "Griffith (C)". 2016 Census QuickStats. Retrieved 7 July 2017. ^ Australian Bureau of Statistics (27 June 2017). "Gundagai (A)". 2016 Census QuickStats. Retrieved 7 July 2017. ^ "Gundagai Council". Stronger Councils. Government of New South Wales. 12 May 2016. Archived from the original on 11 June 2016. Retrieved 21 May 2016. ^ Australian Bureau of Statistics (27 June 2017). "Hay (A)". 2016 Census QuickStats. Retrieved 7 July 2017. ^ "Government Gazette Proclamations and Legislation". New South Wales Government Gazette (Sydney, NSW: 1832–1900). 27 July 1886. p. 4993. Retrieved 20 June 2018. ^ Australian Bureau of Statistics (27 June 2017). "Junee (A)". 2016 Census QuickStats. Retrieved 7 July 2017. ^ "Irrigation Act, 1912–1926". Government Gazette of the State of New South Wales (Sydney, NSW: 1901–2001). 6 January 1928. p. 42. Retrieved 20 June 2018. ^ Australian Bureau of Statistics (27 June 2017). "Leeton (A)". 2016 Census QuickStats. Retrieved 7 July 2017. ^ Australian Bureau of Statistics (27 June 2017). "Lockhart (A)". 2016 Census QuickStats. Retrieved 7 July 2017. ^ Australian Bureau of Statistics (27 June 2017). "Murrumbidgee (A)". 2016 Census QuickStats. Retrieved 7 July 2017. ^ "Murrumbidgee Council". Stronger Councils. Government of New South Wales. 12 May 2016. Retrieved 13 May 2016. ^ Australian Bureau of Statistics (27 June 2017). "Snow Valleys (A)". 2016 Census QuickStats. Retrieved 7 July 2017. ^ "Snowy Valley Council". Stronger Councils. Government of New South Wales. 12 May 2016. Retrieved 13 May 2016. ^ Australian Bureau of Statistics (27 June 2017). "Narrandera (A)". 2016 Census QuickStats. Retrieved 7 July 2017. ^ Australian Bureau of Statistics (27 June 2017). "Temora (A)". 2016 Census QuickStats. Retrieved 7 July 2017. ^ Australian Bureau of Statistics (27 June 2017). "Wagga Wagga (C)". 2016 Census QuickStats. Retrieved 7 July 2017. ^ "Government Gazette Proclamations and Legislation - New South Wales Government Gazette (Sydney, NSW: 1832–1900) - 15 Mar 1870". nla.gov.au. Retrieved 3 March 2017. ^ "Greater Newcastle metropolitan planning". www.planning.nsw.gov.au. Retrieved 25 September 2018. ^ Australian Bureau of Statistics (27 June 2017). "Cessnock (C)". 2016 Census QuickStats. Retrieved 7 July 2017. ^ a b c "Proclamation - Government Gazette of the State of New South Wales (Sydney, NSW: 1901–2001) - 7 Mar 1906". nla.gov.au. Retrieved 3 March 2017. ^ Australian Bureau of Statistics (27 June 2017). "Dungog (A)". 2016 Census QuickStats. Retrieved 7 July 2017. ^ "Government Gazette Proclamations and Legislation - New South Wales Government Gazette (Sydney, NSW: 1832–1900) - 16 May 1893". nla.gov.au. Retrieved 3 March 2017. ^ Australian Bureau of Statistics (27 June 2017). "Lake Macquarie (C)". 2016 Census QuickStats. Retrieved 7 July 2017. ^ Australian Bureau of Statistics (27 June 2017). "Maitland (C)". 2016 Census QuickStats. Retrieved 7 July 2017. ^ "Local Government Act, 1919 — Proclamation – Government Gazette of the State of New South Wales (Sydney, NSW: 1901–2001) - 7 Dec 1945". nla.gov.au. Retrieved 3 March 2017. ^ Australian Bureau of Statistics (27 June 2017). "Mid-Coast (A)". 2016 Census QuickStats. Retrieved 7 July 2017. ^ "Mid-Coast Council". Stronger Councils. Government of New South Wales. 12 May 2016. Retrieved 12 May 2016. ^ "Government Gazette Proclamations and Legislation". New South Wales Government Gazette (Sydney, NSW: 1832–1900). 13 April 1870. p. 859. Retrieved 20 June 2018. ^ Australian Bureau of Statistics (27 June 2017). "Muswellbrook (A)". 2016 Census QuickStats. Retrieved 7 July 2017. ^ "Government Gazette Proclamations and Legislation". New South Wales Government Gazette (Sydney, NSW: 1832–1900). 26 January 1848. p. 121. Retrieved 15 June 2018. ^ "Municipality of Newcastle - Proclamation - New South Wales Government Gazette (Sydney, NSW: 1832–1900) - 8 Jun 1859". nla.gov.au. Retrieved 3 March 2017. ^ Australian Bureau of Statistics (27 June 2017). "Newcastle (C)". 2016 Census QuickStats. Retrieved 7 July 2017. ^ Australian Bureau of Statistics (27 June 2017). "Port Stephens (A)". 2016 Census QuickStats. Retrieved 7 July 2017. ^ Australian Bureau of Statistics (27 June 2017). "Singleton (A)". 2016 Census QuickStats. Retrieved 7 July 2017. ^ "Municipal Institutions - Municipality of Singleton. Proclamation - New South Wales Government Gazette (Sydney, NSW: 1832–1900) - 2 Feb 1866". nla.gov.au. Retrieved 3 March 2017. ^ Australian Bureau of Statistics (27 June 2017). "Upper Hunter Shire (A)". 2016 Census QuickStats. Retrieved 7 July 2017. ^ Australian Bureau of Statistics (27 June 2017). "Kiama (A)". 2016 Census QuickStats. Retrieved 7 July 2017. ^ Australian Bureau of Statistics (27 June 2017). "Shellharbour (C)". 2016 Census QuickStats. Retrieved 7 July 2017. ^ "Local Government Act, 1919 — Proclamation". Government Gazette of the State of New South Wales (Sydney, NSW: 1901–2001). 13 July 1979. p. 3356. Retrieved 15 June 2018. ^ Australian Bureau of Statistics (27 June 2017). "Shoalhaven (C)". 2016 Census QuickStats. Retrieved 7 July 2017. ^ Australian Bureau of Statistics (27 June 2017). "Wingecarribee (A)". 2016 Census QuickStats. Retrieved 7 July 2017. ^ Australian Bureau of Statistics (27 June 2017). "Wollongong (C)". 2016 Census QuickStats. Retrieved 7 July 2017. ^ Australian Bureau of Statistics (27 June 2017). "Ballina (A)". 2016 Census QuickStats. Retrieved 7 July 2017. ^ Australian Bureau of Statistics (27 June 2017). "Byron (A)". 2016 Census QuickStats. Retrieved 7 July 2017. ^ Australian Bureau of Statistics (27 June 2017). "Kyogle (A)". 2016 Census QuickStats. Retrieved 7 July 2017. ^ Australian Bureau of Statistics (27 June 2017). "Lismore (C)". 2016 Census QuickStats. Retrieved 7 July 2017. ^ "Historical information about the City of Lismore". City of Lismore. 2016. Retrieved 28 May 2016. ^ Australian Bureau of Statistics (27 June 2017). "Richmond Valley (A)". 2016 Census QuickStats. Retrieved 7 July 2017. ^ Australian Bureau of Statistics (27 June 2017). "Tweed (A)". 2016 Census QuickStats. Retrieved 7 July 2017. ^ Australian Bureau of Statistics (27 June 2017). "Bega Valley (A)". 2016 Census QuickStats. Retrieved 7 July 2017. ^ Australian Bureau of Statistics (27 June 2017). "Eurobodalla (A)". 2016 Census QuickStats. Retrieved 7 July 2017. ^ Australian Bureau of Statistics (27 June 2017). "Goulburn Mulwaree (A)". 2016 Census QuickStats. Retrieved 7 July 2017. ^ Australian Bureau of Statistics (27 June 2017). "Hilltops (A)". 2016 Census QuickStats. Retrieved 7 July 2017. ^ "Hilltops Council". Stronger Councils. Government of New South Wales. 12 May 2016. Retrieved 13 May 2016. ^ Australian Bureau of Statistics (27 June 2017). "Queanbeyan-Palerang Regional (A)". 2016 Census QuickStats. Retrieved 7 July 2017. ^ "Queanbeyan-Palerang Regional Council". Stronger Councils. Government of New South Wales. 12 May 2016. Retrieved 13 May 2016. ^ Australian Bureau of Statistics (27 June 2017). "Snowy Monaro Regional (A)". 2016 Census QuickStats. Retrieved 7 July 2017. ^ "Snowy Monaro Regional Council". Stronger Councils. Government of New South Wales. 12 May 2016. Retrieved 13 May 2016. ^ Australian Bureau of Statistics (27 June 2017). "Upper Lachlan Shire (A)". 2016 Census QuickStats. Retrieved 7 July 2017. ^ Australian Bureau of Statistics (27 June 2017). "Yass Valley (A)". 2016 Census QuickStats. Retrieved 7 July 2017. ^ Australian Bureau of Statistics (27 June 2017). "Armidale Regional (A)". 2016 Census QuickStats. Retrieved 7 July 2017. ^ "Government Gazette Proclamations and Legislation". New South Wales Government Gazette (Sydney, NSW: 1832–1900). 17 June 1872. p. 1563. Retrieved 20 June 2018. ^ Australian Bureau of Statistics (27 June 2017). "Glen Innes Severn (A)". 2016 Census QuickStats. Retrieved 7 July 2017. ^ Australian Bureau of Statistics (27 June 2017). "Gunnedah (A)". 2016 Census QuickStats. Retrieved 7 July 2017. ^ "Government Gazette Proclamations and Legislation - New South Wales Government Gazette (Sydney, NSW: 1832–1900) - 19 Sep 1885". Trove. Retrieved 1 October 2016. ^ Australian Bureau of Statistics (27 June 2017). "Gwydir (A)". 2016 Census QuickStats. Retrieved 7 July 2017. ^ Australian Bureau of Statistics (27 June 2017). "Inverell (A)". 2016 Census QuickStats. Retrieved 7 July 2017. ^ "PROCLAMATION. - By His Excellency Sir Alfred Stephen, Knight, a Companion of the Most Honorable Order of the Bath, Chief Justice of the Colony of New South Wales, Administering the Government thereof. - New South Wales Government Gazette (Sydney, NSW: 1832–1900) - 5 Mar 1872". nla.gov.au. Retrieved 3 March 2017. ^ Australian Bureau of Statistics (27 June 2017). "Liverpool Plains (A)". 2016 Census QuickStats. Retrieved 7 July 2017. ^ Australian Bureau of Statistics (27 June 2017). "Moree Plains (A)". 2016 Census QuickStats. Retrieved 7 July 2017. ^ "Government Gazette Proclamations and Legislation - New South Wales Government Gazette (Sydney, NSW: 1832–1900) - 5 Dec 1890". nla.gov.au. Retrieved 3 March 2017. ^ "Government Gazette Proclamations and Legislation". New South Wales Government Gazette (Sydney, NSW: 1832–1900). 28 September 1895. p. 6307. Retrieved 15 June 2018. ^ Australian Bureau of Statistics (27 June 2017). "Narrabri (A)". 2016 Census QuickStats. Retrieved 7 July 2017. ^ Australian Bureau of Statistics (27 June 2017). "Tamworth Regional (A)". 2016 Census QuickStats. Retrieved 7 July 2017. ^ Australian Bureau of Statistics (27 June 2017). "Tenterfield (A)". 2016 Census QuickStats. Retrieved 7 July 2017. ^ "Government Gazette Proclamations and Legislation - New South Wales Government Gazette (Sydney, NSW: 18321900) - 23 Nov 1871". nla.gov.au. Retrieved 3 March 2017. ^ Australian Bureau of Statistics (27 June 2017). "Uralla (A)". 2016 Census QuickStats. Retrieved 7 July 2017. ^ "Government Gazette Proclamations and Legislation - New South Wales Government Gazette (Sydney, NSW: 1832–1900) - 24 Apr 1882". nla.gov.au. Retrieved 3 March 2017. ^ Australian Bureau of Statistics (27 June 2017). "Walcha (A)". 2016 Census QuickStats. Retrieved 7 July 2017. ^ Australian Bureau of Statistics (27 June 2017). "Bathurst Regional (A)". 2016 Census QuickStats. Retrieved 7 July 2017. ^ Australian Bureau of Statistics (27 June 2017). "Blayney (A)". 2016 Census QuickStats. Retrieved 7 July 2017. ^ "Government Gazette Proclamations and Legislation - New South Wales Government Gazette (Sydney, NSW: 1832–1900) - 1 Nov 1882". nla.gov.au. Retrieved 3 March 2017. ^ Australian Bureau of Statistics (27 June 2017). "Cabonne (A)". 2016 Census QuickStats. Retrieved 7 July 2017. ^ Australian Bureau of Statistics (27 June 2017). "Cowra (A)". 2016 Census QuickStats. Retrieved 7 July 2017. ^ Australian Bureau of Statistics (27 June 2017). "Forbes (A)". 2016 Census QuickStats. Retrieved 7 July 2017. ^ "Government Gazette Proclamations and Legislation - New South Wales Government Gazette (Sydney, NSW: 1832–1900) - 4 Jun 1870". nla.gov.au. Retrieved 3 March 2017. ^ Australian Bureau of Statistics (27 June 2017). "Lachlan (A)". 2016 Census QuickStats. Retrieved 7 July 2017. ^ Australian Bureau of Statistics (27 June 2017). "Lithgow (C)". 2016 Census QuickStats. Retrieved 7 July 2017. ^ "Local Government Act, 1919 — Proclamation – Government Gazette of the State of New South Wales (Sydney, NSW: 1901–2001) - 21 Dec 1945". nla.gov.au. Retrieved 3 March 2017. ^ "Government Gazette Proclamations and Legislation - New South Wales Government Gazette (Sydney, NSW: 1832–1900) - 4 Jun 1889". nla.gov.au. Retrieved 3 March 2017. ^ Australian Bureau of Statistics (27 June 2017). "Mid-Western Regional (A)". 2016 Census QuickStats. Retrieved 7 July 2017. ^ Australian Bureau of Statistics (27 June 2017). "Oberon (A)". 2016 Census QuickStats. Retrieved 7 July 2017. ^ Australian Bureau of Statistics (27 June 2017). "Orange (C)". 2016 Census QuickStats. Retrieved 7 July 2017. ^ "Municipality of Orange - Proclamation - New South Wales Government Gazette (Sydney, NSW: 1832–1900) - 9 Jan 1860". nla.gov.au. Retrieved 3 March 2017. ^ Australian Bureau of Statistics (27 June 2017). "2016 Community Profiles: Parkes (A)". 2016 Census of Population and Housing. Retrieved 7 July 2017. ^ "Government Gazette Proclamations and Legislation - New South Wales Government Gazette (Sydney, NSW: 1832–1900) - 1 Mar 1883". nla.gov.au. Retrieved 3 March 2017. ^ Australian Bureau of Statistics (27 June 2017). "Weddin (A)". 2016 Census QuickStats. Retrieved 7 July 2017. ^ Australian Bureau of Statistics (27 June 2017). "Bogan (A)". 2016 Census QuickStats. Retrieved 7 July 2017. ^ Australian Bureau of Statistics (27 June 2017). "Bourke (A)". 2016 Census QuickStats. Retrieved 7 July 2017. ^ "Government Gazette Proclamations and Legislation - New South Wales Government Gazette (Sydney, NSW: 1832–1900) - 4 Jul 1878". nla.gov.au. Retrieved 3 March 2017. ^ Australian Bureau of Statistics (27 June 2017). "Brewarrina (A)". 2016 Census QuickStats. Retrieved 7 July 2017. ^ "Proclamation - Government Gazette of the State of New South Wales (Sydney, NSW: 1901–2001) - 15 Jan 1901". nla.gov.au. Retrieved 3 March 2017. ^ Australian Bureau of Statistics (27 June 2017). "Cobar (A)". 2016 Census QuickStats. Retrieved 7 July 2017. ^ "Government Gazette Proclamations and Legislation - New South Wales Government Gazette (Sydney, NSW: 1832–1900) - 18 Mar 1884". Trove. Retrieved 1 October 2016. ^ Australian Bureau of Statistics (27 June 2017). "Coonamble (A)". 2016 Census QuickStats. Retrieved 7 July 2017. ^ "Government Gazette Proclamations and Legislation - New South Wales Government Gazette (Sydney, NSW: 1832–1900) - 3 May 1880". nla.gov.au. Retrieved 3 March 2017. ^ Australian Bureau of Statistics (27 June 2017). "Western Plains Regional (A)". 2016 Census QuickStats. Retrieved 7 July 2017. ^ "Western Plains Regional Council". Stronger Councils. Government of New South Wales. 12 May 2016. Archived from the original on 11 June 2016. Retrieved 17 May 2016. ^ Australian Bureau of Statistics (27 June 2017). "Gilgandra (A)". 2016 Census QuickStats. Retrieved 7 July 2017. ^ Australian Bureau of Statistics (27 June 2017). "Narromine (A)". 2016 Census QuickStats. Retrieved 7 July 2017. ^ "Proclamation - New South Wales Government Gazette (Sydney, NSW: 1832–1900) - 23 Apr 1898". nla.gov.au. Retrieved 3 March 2017. ^ Australian Bureau of Statistics (27 June 2017). "Walgett (A)". 2016 Census QuickStats. Retrieved 7 July 2017. ^ Australian Bureau of Statistics (27 June 2017). "Warren (A)". 2016 Census QuickStats. Retrieved 7 July 2017. ^ "Government Gazette Proclamations and Legislation - New South Wales Government Gazette (Sydney, NSW: 1832–1900) - 24 Apr 1895". nla.gov.au. Retrieved 3 March 2017. ^ Australian Bureau of Statistics (27 June 2017). "Warrumbungle Shire (A)". 2016 Census QuickStats. Retrieved 7 July 2017. ^ Australian Bureau of Statistics (27 June 2017). "Broken Hill (C)". 2016 Census QuickStats. Retrieved 7 July 2017. ^ "Government Gazette Proclamations and Legislation - New South Wales Government Gazette (Sydney, NSW: 1832–1900) - 24 Sep 1888". nla.gov.au. Retrieved 3 March 2017. ^ Australian Bureau of Statistics (27 June 2017). "Central Darling (A)". 2016 Census QuickStats. Retrieved 7 July 2017. ^ "Local Government Act, 1919 — Proclamation – Government Gazette of the State of New South Wales (Sydney, NSW: 1901–2001) - 20 Mar 1959". nla.gov.au. Retrieved 3 March 2017. ^ "Government Gazette Proclamations and Legislation - New South Wales Government Gazette (Sydney, NSW: 1832–1900) - 6 Feb 1883". nla.gov.au. Retrieved 3 March 2017. ^ Australian Bureau of Statistics (27 June 2017). "Unincorporated NSW". 2016 Census QuickStats. Retrieved 15 June 2018.